Usage Stats are available to staff who have been set up an “Administrator” on the MyWorldAbroad site. (NOTE: Usage stats may take 30+ minutes to generate.) 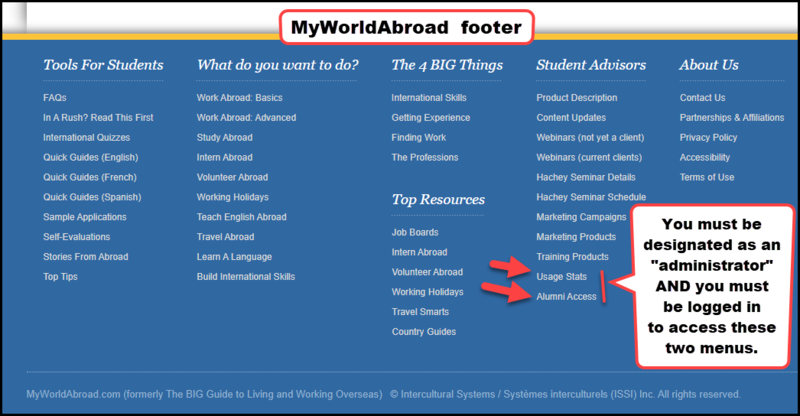 These Administrators have access to two additional menus in the “Student Advisors” column located in the MyWorld footer (view). Contact our client services department by e-mail to designate a staff person as an Administrator in our system. 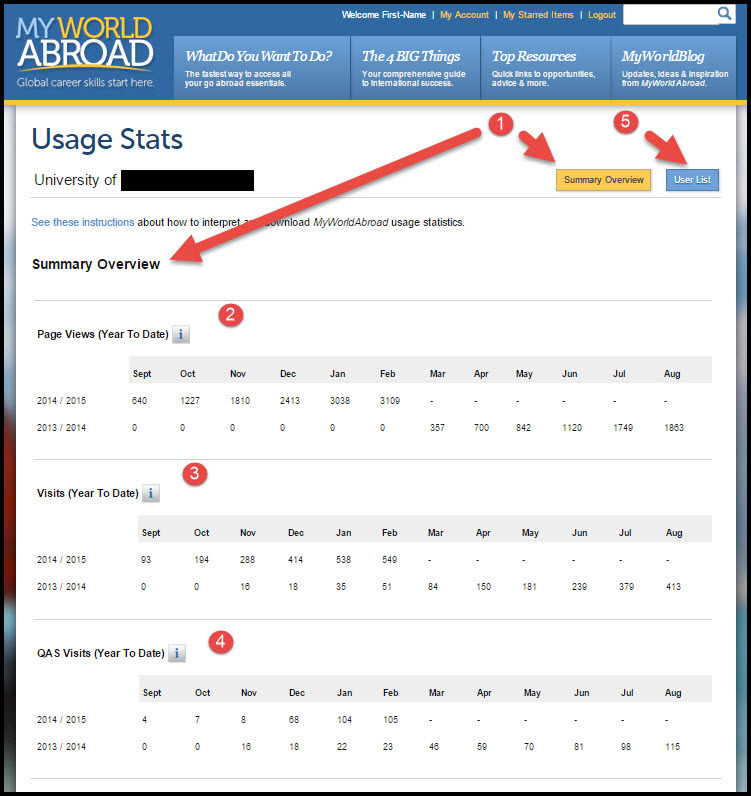 The level of usage for MyWorldAbroad is directly proportional to your school’s marketing efforts. A simple link on your school’s web page is not enough to raise awareness and encourage students to make use of the site. From a student's perspective, a link to MyWorldAbroad on a school's website is simply one of trillions of links available on the internet. Students need to hear that their school recommends and endorses access to MyWorldAbroad. 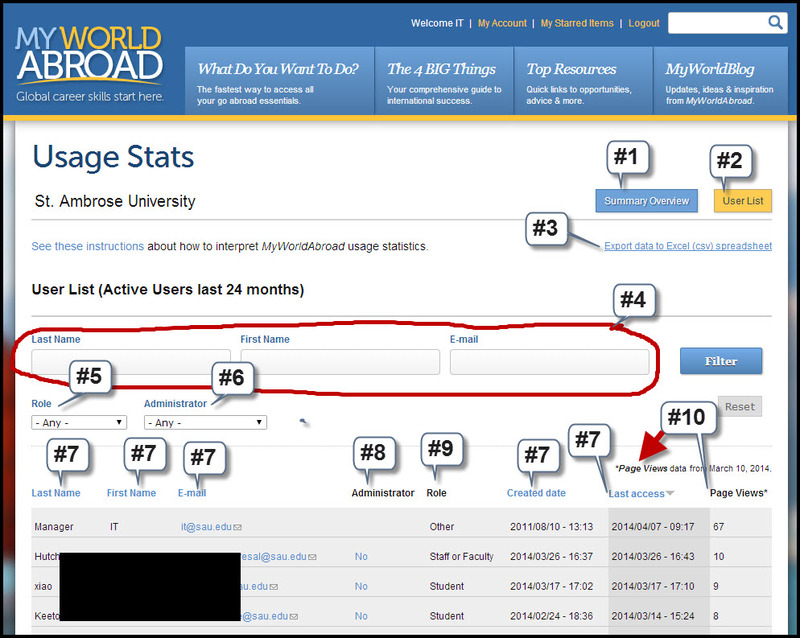 For the average student, it takes seven or more reminders about MyWorldAbroad before they take the initiative and visit the site. Here at the MyWorldAbroad offices, we consider ourselves to be your partner in promoting the importance of global career skills on campus. As such, we have developed 50+ individual marketing project descriptions to help you publicize the availability of MyWorldAbroad to your students (see Marketing Campaigns). We encourage you to make use of as many of these projects as possible. Best wishes to you and your students! COMPARING YOUR USAGE STATS WITH OTHER SCHOOL? Usage stats are only one component in measuring usage and each school is different in how they use MyWorldAbroad. Some schools focus on making use of our Training Products (Quizzes, Quick Guides, Self-Evaluation questionnaires, webinars etc.) to train staff and/or a small core of students participating in an international program. Other schools see our system as tool for one on one advising. On a broader scale, most vendors of online services consider a 3% student usage rate to be a top number. Below is a sample of the Summary Overview page (see #1) which compiles historical data collected since Feb-March 2014 and shows year-by-year comparisons. Usage Stats are up-dated live: You school's usage data is up-date each time you view the report. Page Views (Year to Date) (see #2): Note that "Year to Date" calculates cumulative data for the academic year starting in September. QAS Visit (Year to Date) (see #4): Measures the number of visit for those schools that are using our Quick Access System (QAS). User List (see #5): This screen show the list of active users during the past 24 months. These are the main tips about our User List page (numbers #1 to #10 refer to the screen shot below). Usage Stats are accessible from the MWA footer (view). What is an "Active User"? The User List page provides you with a list of “Active Users” who have visited the site during the past 24 months. Active users include new registrations PLUS users who registered in the past and are still using the site. An active user is only counted once. For instance, if a user registered three years ago, logged in 20 months ago, then logged in again two months ago, their information will only appear once on the User List. Schools using our Quick Access System (QAS): Many of our client schools use QAS, which does not require students to go through the registration process in order to access MyWorldAbroad. Please note that our User List page DOES NOT SHOW the number of QAS visitors. QAS-Visitor-data is collected and available in the Summary Overview page. See details above. About designating administrators (see #6 and #8): You must be designated as an "Administrator" in our system in order to access the User Stats page and the Alumni Registration page. Contact us to set up a new administrator at your school. About Page Views (see #10): Page Views are one of the tools to indicate usage levels. We began collecting this data as of March 10, 2014. The statistics, therefore, do not reflect usage before that date. Quick Filter (see #4): Quickly locate a student, alumnus or staff user with this filter. Note that you only need to enter part of a name or e-mail address in the appropriate filter fields. Find out which staff members are using MyWorldAbroad (see #5 and #9): Staff who use MyWorldAbroad regularly make a big difference in promoting the value of the site to students. To find out which staff are making use of MyWorldAbroad, use the Role field and filter for the term Staff. Please note that the User List page only provides information on staff who have used the system during the past 24 months. Sort by column (see #7): The default sort order is in the Last Access field of the Usage Statistics page, so the most recent users are at the top of the page. Click on the any of the blue column headers to change the sort order, (For example, click on Last Name to sort alphabetically on that field). Export data to an Excel (csv) spreadsheet (see #3): You can easily export the list of your active users in order to do detailed, customized analysis. See more details below. Summary Overview (see #1): Historical and Year to Date data (monthly cumulative data starting each September). See more details at the top of this page. Your school may have chosen to make use of our Quick Access System (QAS) that allows students can access MyWorldAbroad directly without registering. The User List page DOES NOT MEASURE the level of access to MyWorldAbroad for QAS users except in terms of Page Views (see next screen shot). The User List page has a button for “Export data to Excel (csv) spreadsheet,” which allows you to easily export a list of active users to an Excel spreadsheet. This Excel file will provide you with additional fields to perform detailed analysis. For example, change the sort order or manually code data. Student Year of Study: This information is found looking at the Detail column (see #1 in screenshots below), and where the term in the Role field is Student. When the Detail column shows a year, this indicates when a student “started” university. Use the “started” year to calculate the student’s current year of study such as first year, second year or third year. You can sort data in Excel by going to the Data tab and choosing Sort (see screenshot below). The example below sorts on the Last Access filed to find out how many Active Users there were in the last two years. NOTE: An Active User is only counted once: if they registered three years ago, and logged in 20 months ago, and then logged in again two months ago, they will only show up once in the User List.